If you are a cat owner, you might have to deal with cat chewing. Most commonly, cats chew on things such as phone cords and wires. This is not only annoying to you, but it is also dangerous for your cat. When your cat chews on cords and wires, it exposes the wiring inside, which could lead to an electric shock. Also, small parts of the wires and the plastic coverings could be eaten by your cat, causing problems with his digestive tract. If you have a chewing cat, you can use repellents to discourage the behavior. Cut tinfoil into sheets 4 to 5 inches wide and 12 inches long. Gather groups of wires and cords together, then either tie them together with a length of string or tape them together. This not only makes it easier to wrap them in tinfoil, but it also makes the finished product thicker, which will be harder for your cat to fit in her mouth. Wrap the tinfoil around the cord so that it covers the entire wire several times. You might need additional foil depending on the length of your wires and the length of the tinfoil. Squeeze the tinfoil to tighten it around the wire. This will discourage cats. They do not like the sound of tinfoil when they chew on it. Cut a lemon in half using a knife. Unplug all wires and cables. You do not want any electricity running through the wires at this point. Squeeze your cut lemon along the length of the wires. Use your fingers to rub the lemon juice into the wires. Leave the wires to dry. Plug back in your wires and cables. The taste of the lemon on wires will discourage most cats. You can reapply more lemon juice once every three to four days to keep the flavor strong. When choosing cables and wires, consider thicker cables if you have an option. 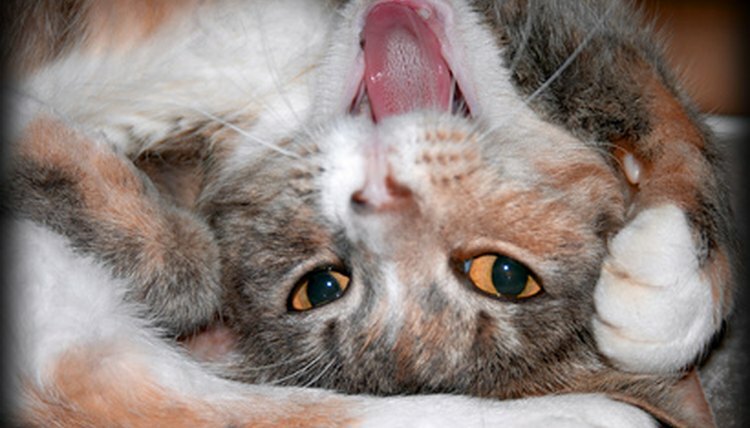 Cats prefer thinner wires and the thicker ones will be harder to chew on. Also consider wireless when you have an option. Fewer wires give your cat less temptation. Keep wires up. If your cat sees dangling cords, he will want to play with them and explore them, which often leads to chewing on them. Instead of tin foil, try using double sided sticky tape. Cats do not like sticky things in their mouths and will likely try to avoid it in the future. Instead of lemon juice, you can also use liquid dish detergent, bar soap, nail biting bitters or bitter apple pet deterrent sprays.